I just got my wireless shutter remote in the mail on Friday and didn't have a chance to play with it with the kids...though I did have fun running around the living room and playing with it by myself. I promptly deleted all those photos to save myself embarrassment at a later date. Hopefully I will think of something fun to do with the kids and my new toy this coming week! 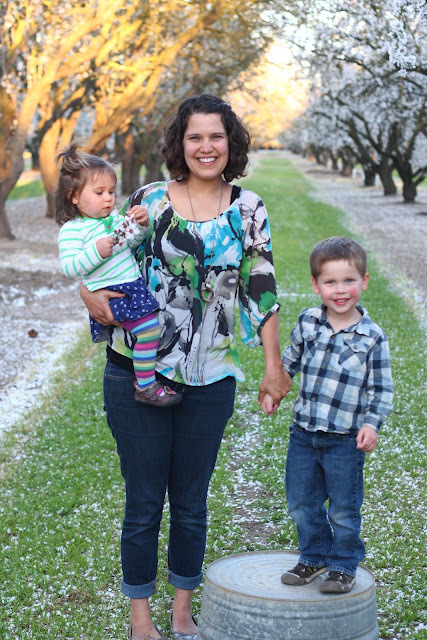 We took the kids to the almond orchards to take some pictures with the trees in bloom. Connor was not a willing participant in the whole picture taking exercise. Notice the death grip I have on him. There are more pictures to come from the almond orchards. Probably way more than you want to see will soon be headed your way. It was a long week that went from the stomach flu to bad colds and ear infections. None of us have gotten an uninterrupted night's sleep this past week. It has been exhausting. Connor still wants to run around and play, but whenever we let him, he gets in a coughing fit and ends up throwing up. Awesome. My aunt shared this article with me on temper tantrums. If you have a toddler, it is a good read. I tried baking cake in a jar this week. It was semi-successful. It tasted good, but I overfilled the jars, so when I was baking them, the cake spilled out everywhere. We went for a family walk this morning. It's been a while since we have done that and I really like it. hi, jessica! it's tricia from bohomamasoul! i absolutely love your blog! you're a fantastic writer, and your post "who i am" was such a great one. and you have TWO babies, my dear! three is still very much a little one, so don't be discouraged. you'll get pregnant when the time is right, as cliched and trite as that is. i'm so glad you commented on my blog so that i could find my way to yours! YAY wireless remote! Send me the link. I want to get one. I love picture and can't wait to see more! !